Let us see some analysis of current market conditions. Most of the people are rushing to buy now for long term . but this may not be a market to buy for long term. I am myself Bullish now, but for short term not long term. I would not be surprised to see markets rise by over 10-15% more over next 1-2 months till the Budget but sooner or later I expect. The simple analysis is with a simple and strong tool called PE ratio. PE ratio tells us how expensive or cheap is the current underlying. In other words what kind of value does the market provide us , irrespective of the price. Historically Nifty has been considered and shown instances of being oversold in range of 10-13 and overbought in range of 20-25. Nifty has had a crash after after getting in the range of 20-25 and have rallied after touching the range of 10-13 . You will see that whenever nifty crossed 20. It was time to be cautious. its not exactly the time to go short sell, but at least book your partial profits and be cautious with further buying for long term. Current situation : As I write this, Nifty PE is around 21. Its not a very good situation to madly buy for long term. Its a time when euphoria is at high point and it can take markets a little further. So you can jump in now with short term perspective, not long term ! !, because markets may fall in some weeks or months. Expect it. but don’t force it !! . Who all missed the current Rally? I missed it. there are two reasons, I am a trader not an investor for long term (at least currently). So I do not concentrate on it. But you could have not missed it if you had read this concept earlier and had the guts to go against the so called “experts on CNBC” who were talking about 5k or 6k for NIFTY some months back. If you see the chart, you can see that after touching the PE levels of 11-13, markets have rallied back as it was too oversold !! Again, just touching these levels of PE does not signal a BUY, its only a signal to be cautious and make your mind for long side, and start the accumulation process without fear. Markets will still make lower levels and experts on CNBC will still cry over economy conditions and world coming to an end. But market rewards the “risk assumption”, not the actions on obvious facts. You also have to decide how much money of your portfolio would you like to put in stock market after considering your risk-appetite. What can we learn from this PE Concept? This is true for almost 95% of the long term investors all over the world. They do not learn things, they do not do any research, they do not go and read blogs or tons of informational sites, they just want tips from others and make money. the mathematical expectation of that kind of investing is negative and cant work for long term. BUY Signal : Once PE crosses below 13. When NIFTY PE reached levels of 13 , start accumulating the stocks and invest your money in 4-5 installment over some months. Make sure that markets are going up and down and moving in a range . If PE crosses below 11 , its a must BUY !! SELL Signal : Once PE crosses above 20. Book the profit once NIFTY PE crosses above 20, Don’t book all profits at once. Book it in parts. PE crossing above 20 does not mean markets has to fall, its only an indication that markets may be oversold and now “smart people” will starting selling there shares to mad public. Short sell the shares once PE and Markets start falling down from PE levels of 20. If PE crosses above 25, its a must SELL !! This is the time when your buying in parts and putting capital which you can afford to loose will help !! Anyone who puts 100% of there money in stock market at once on one single time on a single bet has a secret affair with financial disaster which he/she himself is not aware of. So don’t put all your money at once. Only put a part of your capital at any point . I have divided Nifty Value by 100 to make the graph look the way it is . In graphs , so on X axis if you see 40 , then read it as 4000 for nifty . but exact 40 for PE . PE value will be separate for individual stocks as PE ratio for stock can go up or down for many other reasons . So if you are doing Stock analysis , see its historical PE values and find some pattern yourself . Innovate !! I hope you have got a clear idea about Nifty PE. If you still have any confusion you can leave your query in our comment section. Also do let us know your opinion about this article. Great Article!!! Love your blog. Thank you for such a informative article. I am a learner and silent reader of jagoinvestor…..wish to get some more detailed discussion regarding “valuation of stock” or approach to pick promising stock. Hello Manish it really an eye opener, I am felling that I am reading this article at right time as right now nifty pe is 23.80 as of 28-Feb-2015. Thanks for nice article. It does not make sense and it will underperform because even if PE is at high level, the Fund will have minimum 65 percent allocation to equity if it’s an Equity Fund. As am individual if market expensive one can exit fully and park in Debt till the time PE falls to attractive levels to re enter. Do you have the data which shows that If I had invested Rs 100 in Nifty 10 years ago and based on the PE movements made the switches, then what would be corpus today? Did this PE based approach outperform buy and strategy over lat 10 years? Could you please update the link on nseindia.com to check the PE values. I am unable to get it on the new site of NSE. Can you do that yourself and let us also know the updated links ! Just wanted to clarify – the chart that you posted in 2009 with the PE values – is that based on trailing twelve months or 1-year forward PE? Tried to see if its clarified anywhere but you haven’t mentioned it specifically. Would appreciate a response. Am doing some analysis myself and will post the results when I am done. Again, good job with the blog. Cheers. i am new to stock market and want to know buying /selling stocks in BSE and how to trade in nifty. how it is different together. thanks for your help, you are doing in this blog. Hi Manish, I am a big fan of your blog.How true was this post , when it was posted a year ago.I am a long term investor ,investing via mutual funds for the last 6-7 years.One thing I am confused of,The PE of Sensex/Nifty according to BSE/NSE website is app. 17.5,while Bloomberg quotes the PE at 15.5.Even the experts on CNBC keep on saying the current PE is around 15.I researched on the net and found that the difference is because the EPS is calculated by standalone method in BSE and by consolidated method in Bloomberg. What you think is the current PE.and which one Investor should follow for investments. I HAVE JOINED RECENTLY , I DONT HAVE WORDS TO EXPRESS. G8 artical for understanding in a simple mannar. Manish can we see historical individual stock P/E for as above analysis ??? Awaiting for your kind analysis skill …..
Stocks PE are generally not available for many years . I am wondering how you are getting many many matters in various finacial topics like this..How is it possible? Are you having any secret connection with IIM professors or any other financial Kings?.. Really Great..All the lines you are writing r easily understandable by anyone.. Please continoue your Job(Service) to all sleeping people not only in India all over the world.. This is the first time i am writing some comment although i am learning from your blogs long back. Really its a excellent stuff for an investor. I really love the style of your writing, all queries covered which can be generated over on Subject line. Really a structured method. You r doing a gr8 job. Please keep continue. I am in SIP for both NIFTY BEES and Junior BEEs and i am not gonna stop just because the current P/E is >20.As SIP should give me good return over a period. Now the thing i did not understand is people saying BUY and SELL. This mean the buy NIFTYBEE and Sell NIFTYBee? at the appropriate P/E? 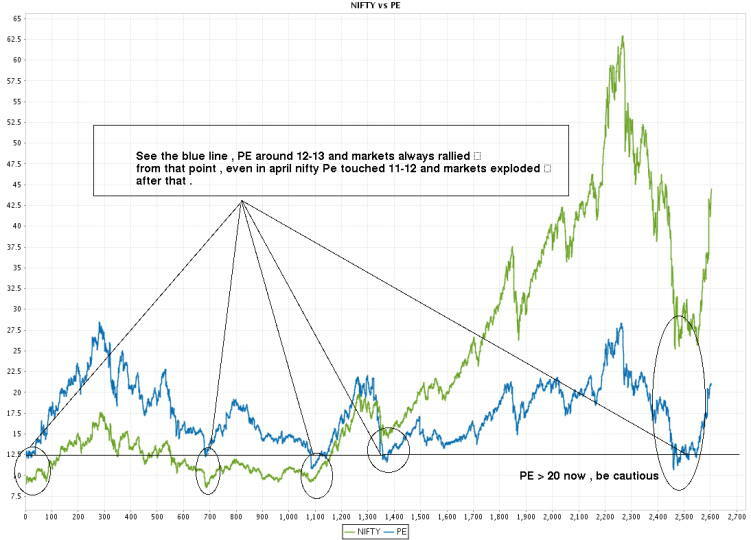 Also if Nifty PE is at 10-12 is that a good time to buy Nifty50 stocks? When you say that you wont not sell or buy just on NIFTY PE and continue , its fine from long term point of view .. However If you try to do take some time out and try to transact based on Nifty PE , it gives you an edge towards buy and hold because you are doing value investing based on Nifty PE , imagine selling at highest point and then keeping your money for next 1 yrs , when markets fall by 50% and then again deploying it at lowest point when PE is around 10-12 , when it comes back to the original level , you double your money ,rather than 0% increase in case you just hold it . if Nifty PE is at 10-12 is that a good time to buy Nifty50 stocks? will this also be value investing if i do it? I would like to apply the PE Theory inindividual stocks such as SUZLON ENERGY and other battered stocks only to find best entry point. Is the value 10-12 in individual stocks also? No , its not exactly the same number for individual stocks , you have to find out what are min and max numbers in case of some stock . Did you get individual PE value for stocks ? from where ? Don’t you find it intriguing that every time the market goes down, it definitely goes to touch the 12. * (i.e. twelve point something) PE? It almost seems like all this is pre-planned by someone :). In a 10-year period, it touched the 12. * PE five times. This means 5 investment opportunities. The thing that intrigues me is…why 12? And why 12 in such a consistent manner every time? I see no reason why in the future it shouldn’t go back to 12 because it has already happened this way consistently for 10 years. In these 10 years (i.e. 5 times), there has not even been any great reason for the crash to 12. * levels (except the most recent time when global recession fears came in). Its not exactly 12 , but a region , 10-12 on lower side and 25-27 on higher side , its a kind of magic number which tells you over bought and over sold regions , while its not mandatory that it will happen everytime , it can move 2-3 points more down or up , depending on how mad people are and drive the market. Its more of a technique/analysis which very less people are aware of and use and hence make better returns . The region on the lower side has remained the same over the past 10 years. Do you have any idea if it did the same before that? Also, if one was planning to buy into that region and as you suggest that this region might go up or down 2-3 points depending on people…I agree that what has happened for 10 years could change in the future. So, how does one not miss the bus? What else can one analyze to say that the market is in the buyable region now? One also has to see other things like How long has this bear or bull market run and other indicators of technical analysis . You will have to learn those and how to see long term charts . Thanks again. Your article archive is a wealth of knowledge. Hats off to your efforts. Your knowledge and your desire to do something with that is commendable. Nifty PE as of September 14 is 24.47 according to nseindia.com so what should investor do now? According to your chart it seems to be at very high point historically. Only twice in the last 10 years it has reached such a high. So should I start selling my shares in installments? It has gone upto 27 also in 2007 end , hence we should not be surprised if it crosses it and goes to 28-29 and it can take few months. So the thing you should understand is that this is over bought area right now, but with more upside potential which you cant predict , so I would recommend to be satisfied with you current levels and sell atleast a good part (50%) and enjoy the ride for some more weeks and then sell the rest on any sign of weakness . If markets still goes up after you sell , then dont feel bad and just enjoy , Wait for markets to cool of and then enjoy the blood bath in case it happens , when markets are down and when a time comes when its toughest for you to think of entering , ENTER at that time itself , markets are a place where you have to take decisions which are toughest to take . Is there a way/website to find historical PE ratio of individual stock? e.g. I want to draw a historical chart of L&T’s PE ratio. I am not sure how to do that , you can get enough from google search . I congratulate you again, this time for a technical issue made easier for the man on the road to understand. There is no end to learning…and earning as well ( By all means possible ) . These days there are a few wealth managers or pundits of investings , especially in stocks, who post thier portoflio for the general public to track on a daily basis i.e. stocks bought and sold etc. This is especially found in the US markets ( I am not aware of any investement guru doing the same in Europe or India). Could you suggest a few of whome people like me can track to take guidance from thier investement ? Or would it be possible for you to start such a forum ? (Dosen’t necessarily have to be free ) . I am not sure on this . Will start such a forum at some point in future. For now lets just discuss things over comments area itself . Pingback: Current Situation of Stock market , What should you do now ? Thanks for covering this topic. It could really be very rewarding if one can track Nifty PE and opt in and out of either shares, or even Mutual Funds (Even ULIP). I have tried it once in my ULIP (a pension plan) – till 26th Dec 2008, I was having my investment invested in the Balanced Fund, but the same day i.e., on 26th Dec 2008 (Nifty PE for the day – 12.5), I switched into Growth Fund (100% Equity), from where, there was no looking back for the Indian Stock Market, and it jumped 100% from There, and so do my investment. Therefore, I succeeded in this PE game. Now I am keenly watching Nifty PE for doing exactly the opposite (i.e., Nifty PE going above 24). Thanks anyway! Keep posting such good articles. Nice I also did the same analysis but was not sure whether this is right or not but after reading your blog I got the confidence. But one doubt im having, I did the same analysis for M&M company & find that after the PE of 24 it has not raised further & from this point PE & Price both has decreased so this is the where we can give the sell Call. But what has happened now after the PE of 24, PE & Price both started decreasing & den again started increasing & reached upto PE of 17. AT this point the PE is less than 22 but its price is more than the Price of 22 PE. Can you please suggest on this. Price of share will not always move in line with PE , its just relation .. so the PE is valuation and not a value which should be used to predict price . I would say PE close to 22 should be a SELL signal , considering the historical value is max 24 , make sure you have done this analysis on enough historical data ..
where can i get Historical PE values of individual companies ? I am not sure if there is any source where you can get that info for free . No idea . Can i get this info by paying ? if yes where & how much is the charge ? 9-Feb-00	27.4	1689.65	Sold 0.424 nifty @ 1690 = 716Rs. Can you send the xls sheets to my email (manish@jagoinvestor.com) . I will have a detailed look and may be later do some study on my own . I am encouraged by your work . Now comes the important point , Is this strategy safe or risky ? you can see that the strategy worked in last 10 yrs very well if you dont think about it and just make sure that you follow the rules without fail . You have not considered the scenarios in detail , So after you keep buying the nifty till PE reaches 15 , there are times when market is still falling . In real life when this happens and when your real money is at stake,its a different situation then 🙂 . The psychological pain is too much. Same thing at the time of shorting it when nifty is at 27 , the market may be going up and down and you are just shorting .. without real money , the analysis is happy , but in real life , its too tough to stand that , investors who can take that make money . In future the nifty range can expand for sure .. it can go to 30 also , so we should also have other pointers we should use with Nifty PE . I would say , better target for 25% return and not more and make strategy which is more worth and more probable to succeed . At the end , you have done amazing work . Superb blog!! Great work Manish…. And to all those who are a part of this discussion…. keep it up…. This will really add to value to people like me who are need of quality analysis. your work is amazing…. I did the same thing from Jan 1999 and i am telling you I stopped June 1999, The damn thing is so time consuming….. Hats off to you man!!! thanks for your appreciation .. join the board and get involved in discussions on the blog . even ICICI prudential life insurance co.’s Dynamic P/E Fund uses the same.. but it does look at the trailing P/E… but it tracks the momentum P/E or Forward P/E….. I just mean that its useful to keep researching and learning about art of investing and making money. After all we all work to earn money. But most of us work to earn just enough to make a living, not to create enormous wealth. Perhaps its because most of us don’t believe that we can have enormous wealth. But on the contrary, its very much possible. Warren Buffet always says that. However, few believe him. However, he is too good. We may not achieve 1% of what he can. But we can certainly imagine wealth. The strong desire to make wealth will make us keep thinking about it, learning about it, craving for it. Is it crazy?? I don’t think so. But yes, everthing comes with a price, whether its your patience or whatever. The second point is so powerful that you can earn on an average in a day what your salary will earn you in a month. If you have faith on this and truely believe it, then you start working hard to achieve it. Otherwise you will never have ‘TIME’. It makes me laugh when people say this. How long will keep working to make others wealthy? This is what we all (I mean salaried people) do. We do this day in and day out. But we don’t have any TIME for ourselves. Lets find time for ourselves too. The upsite target can be 5460 (33% above 200DMA) and target PE at 24.28 at this level. At this level when the PE is 22.63, I am certainly not going to invest heavily. I will just allow my SIPs to run (to keep my investment habit going on for long term). I will watch out for the level of 30% above 200DMA and will sell around 10% of my portfolio and then wait for a correction to get in again. Looking at the strong FII inflow, I think the above level is achievable. Thanks. I have the same passion as you do – Investments and Money. Why not learn something which will work hard to earn for you while you sleep……? What learning ? tell me ? E in the PE does all the magic here. Even if one buys at 13/14 or below in a given financial year, if the combined average earnings(E) of nifty decreases over the subsequent years(usually said in the terms of indian economy prospects), then if the pe is above 21 also does not give me a good return(It may give a negative return also). So, the common investor should keep this point. Same thing happens vice versa (combined average earnings increase in subsequent years, but the pe is going down in those years). The main thing one should keep an eye on average trailing earnings of the index under consideration every year apart from pe. But, i don’t know how a common investor gets this value from newspapers or websites. Crucial average index data like average earnings and pe are kept hidden from majority common investors(who don’t/can’t use internet). Not many (financial and non financial) newspapers publish the daily nifty pe. One last thing is that investor should have patience for waiting till pe reaches required levels for buying and selling. Money flows efficiently from impatient to patient over time. Great information , tell me how you get that data ? I understand your points .. Thats the reason I would not recommend using Nifty PE for short term or even medium term trading . I certainly believe in the trailing PE as a good barometer to judge the market. However, it is normally difficult to judge the best time to buy or sale based on trailing PE only. But nevertheless, it does help us to judge when NOT to buy or sell. For example currently the PE is 22.24 which is high historically makes us to decide that its certainly not the right time to make high investments, because the downward risk is high. Similarly, if PE is say, 15, this does help us to decide to safely invest big amounts for long term as historically the downward risk is low. We need to keep in mind that PE is ever changing due to earning changes, moves in the market are based on expected PE and not trailing PE, and each PE unit means around 5-10% move in the market. There is no best PE for right decision because most of the time market bottoms are reached at 18, or 15 or 10. Each of these levels are very high based on percentage. Suppose I sell all my shares when PE reaches at 25 and then wait for the right time to invest. However, I will not know when is the right time, is it when PE is at 20, 18, 15 or 10? This may make me over anxious and keep me self doubt whether I did a mistake? Will the market ever crash? Will the high earnings bring the PE down? I would personally use max 10% of my portfolio to time the market based on trailing PE. Though I have never actively done this, I will certainly like to try it out. All your points are valid and logical , However what part of Analysis do you think is wrong Or unjustified . Or is it that Its all chance ? I agree with your point of being Bullish , But in very long term , In short term , We can not say that its the best time to buy for a normal investor who does not trade with any strategy other than Nifty PE analysis . PE analysis is a great thing, and one must do in order to guage the overall value of the market. Nevertheless, any formula, including formula of PE analisys is boud to fail. For a normal investor there is only one successful formula, that is dollar cost averaging or systematic investment plan. Nice analysis. Right now the PE is approximately 22 (trailing 12 months), however as thrid & fourth quarter of last year was very bad, earning is likely to improve considerably in next two quarters, leading to lower PE in next two quarters if the market remains at present level. Market can fall anytime, even from a PE of reasonable level; markets can go up anytime even on a higher PE. Although timing markets are real waste (at least for me for I have failed everytime), it is better to listen to experts on CNBC. Markets will fall when an overwhelming majorityof them will be bullish and rise when overwhelming majority of them are bearish. Currnetly I see that almost all of them are cautious and biased towards bearish, I feel that even if the market correct the correction will be sharp and short lived. Off course if fundamental of present rally changes (dollary carry trade induced liquidity), there may be real sharp corretion. What we can take is a long term call. In my view one should be bullish on Indian economy for its strength and resilience and hence a long term investor should be willing to err on long side with value approach. Forget it .. Looks like a spam to me ..
1) The PE refects EPS of last 12 months which is like the report card of a student who performed badly as he was suffering from a desease (Extreme Global Recession). So, as the student is now as fit as ever, he will certainly do much better going forward. Hence, the past performance i.e. high past PE looks justified. 2) Retail participation is almost absent currently, when housewives are not recommending stocks, public is not participating in IPOs, etc. 5) The last 12 months PE may not be reflecting the PE for latest quarter, which if factored in, will tame down the PE to some extent, particularly because the earnings were significantly higher in this latest quarter. Nifty PE can be in range of 20-25 for many weeks and we cant predict its movement to deep level . Better ride the momentum for a very short term and book profits (in any) and then sell once NIFty PE is above 25 . Nifty PE is already above 23 as of now. Do you think it will ready for big correction ? or it will touch PE 25 and then come back down? I know its difficult to predict market but through analysis you can have better idea. Need your thoughts on this. Excellent .. You have added great information here.. hats off .. The +-2SD thing which you mentioned is the thing behind the Bollinger band indicator and they theory of overvaluation and undervaluatin applies so well there .. I will try to come up with some article based on the facts similar to you .. Nice one ..
Nifty PE was at 22.41 on 18 Sep. Time to get real cautious! Nice article. Great to find the links to Nifty PE historical data. Guess your article may sound more rounded with following observations added. The implication of the median is that exactly half the time, the Nifty traded below 17.3. The mode shows it most commonly traded between 14-15PE – in fact it traded between 14-15 roughly once in every seven sessions (14.7 per cent). The laws of normal distribution suggest valuations between 14-21 (within one standard deviation of the average) around 68 per cent of the time and valuations between 10-25 (within two SDs) around 95 per cent of the time. The actual stats are 69 per cent and 95.5 per cent respectively so the reality is very close to expectations. If the market is outside Average+/- 1SD, it is at an unusual valuation. Outside Average+/- 2SDs, it is at an extraordinary valuation. A basic buy signal comes at PEs lower than the long-term average. A basic sell signal comes at higher-than-average PEs. This simple rule can be refined by the laws of normal distribution. At the higher end of the 14-21 scale, cut exposure. If the market valuation is near 24, sell. At 14 or below, buy heavily. I dont recommend Trading in short term using Nifty PE .. its an indicator of people emotions and markets state for long term .. You need to see indicators which suits your Time frame .. Nifty PE is definately a NO no ..
where can i get the TTM EPS of nifty. I just came across this blog and it's really informative. Keep up the good work going. Btw, I have a doubt, what should one do if the Nifty trades around PE 14-18 range for sometime. Also I have a feeling that Nifty will not go down to PE 13 or below in a hurry when it fall from higher PE 20 or 21. By going through the historic data's it took a year or so to reach the top when it falls and vice versa. If that is the case, How can the short term investor play in the market? Great to know that you are looking at it from different way now .. How has it helped you ? What do you think about nifty in respect to PE ? This article has made me look at the nifty levels from a different perspective. Has gone through the same seems interesting. Please keep up the work. Sorry if its confusing to you .. I should have been more clear . X axis is the time line . Y axis is for both NIFTY PE and NIFTY Index , but its divided by 1000 for nifty . So if Y axis is 10 at some point , it points to NIFTY PE of 10 and NIFTY Index at 10,000 . Mainly concentrate on high and low points and not the values per se . its main purpose is to demonstrate the relation between Nifty and PE . Make sure you look forward at Nifty PE going higher now . I have yet to try as i have read on 19th august 2009.. Still I am sure it will be interesting.. and wait I also have many interesting things to share with you..will write more later on…God bless you ! Keep up the great work anyway atleast I will be with you.. I am confused about the graphs. 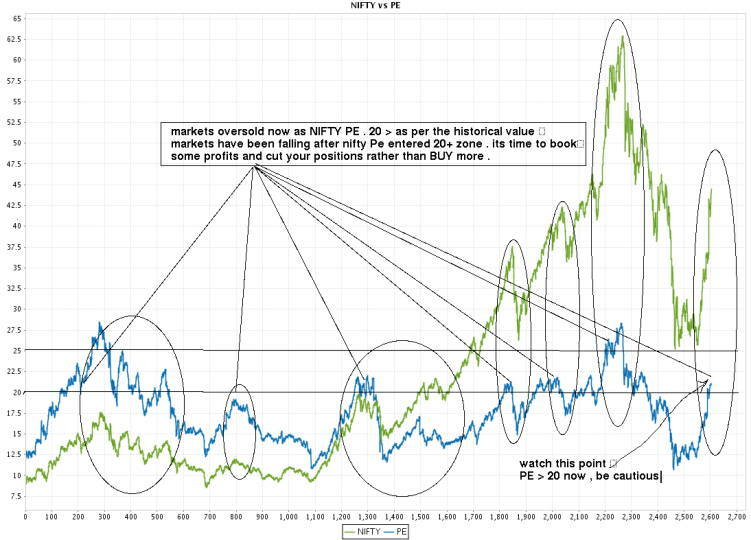 You say it is Nifty vs PE. But there are 2 lines. In a graph between 2 things, there can only be one line. For further confusion, you have labelled one line as PE and the other as Nifty. I guess one of the axes, maybe X, is "time", but I am not sure. If so, you need to plot the actual time values there e.g. year,month,date etc. There is definitely something seriously wrong with the graphs. Which software did you use to plot these graphs? A good software wouldn't let you make such fundamental mistakes. The best thing you can do it to short "futures" or buying "put options" . Read about it through net of search "Futures" on this site . Manish – This is good stuff. To prove I have read it, I am one of those 95% who hasn't done enough research at least on the following question! BUT could you let me know if there is a way of short selling indian stock market indices? Thanks , I joined the group . I liked the approach to take long/short position using PE Ratio analysis. This is the BEST discovery in stock investing that I have come across in the recent past. I have a growing community of india focussed investors viz., The India Investment Network (http://www.linkedin.com/e/vgh/1998285 )I invite you to join the community and post such interesting discussions. This is the community of people interested in investments in India in Business & Trade, Stock Markets, Private Equity, Public and Private Projects, Mergers & Acquisitions, Venture Capital, Angel investments as well as investment opportunities, risks, investing strategies, people and more. We try to provide information about new investments in India through this network and also promote discussions related with investments in India. I am sure that, you will find both the communities interesting and useful. Execellent, excellent article. Gladdens my hear everytime I see an Indian PF/Investment blogger. Keep it up sir!! Keep Reading on net about it , You dont need to read it daily or weekly , Just once in a while you can upgrade your knowledge by reading about it . Thanks Manish. I am kind of out of touch with the IT laws in India.. Yes , Profits from shares and mutual funds (Equity) are taxed in different manner , Its flat 15% if its Short term capital gain (less than 1 yr) and no tax if its long term capital gains (more than 1 yrs) . Last year STGC tax was 10% . Refer to my other articles on Capital Gains and Indexations . Are you sure about that? I am under the assumption that I need to pay more than that depending upon how much my total income is. If my annual income falls into the highest bracket and I earn 10K on shares so I will be taxed on the highest bracket which is more than 15%. If my understanding is not right, please let me know. From your comment I gain that income from equity is taxed in a different manner compared to your other income sources..
You can chat with me at manish.pucsd@gmail.com or manish_chn@yahoo.com or call me at 9886409654 . However , I never said its time to exit . The only thing is that now the valuations are not the best for investing . If you want a quick gain , you can invest some money for short term on dips (with strict stop loss) . Just look for tired look in markets and get out in parts when you identify it . Short it really hart when after some confirmation on break . "the most important part is selling it at the right time" , Very true 🙂 . The PE stuff will help in both exit and entry , A person can buy with low PE's and then let it go until it reaches 20 , and then become cautious , book partial profits on signs of weakness . If you make 10k as profitster , you actually get 8.5k after tax. Back after sometime. I really like this look and feel of the blog looks more structured.. This PE stuff is interesting. Buying the stock at a reasonable price is only half the battle, the most important part is selling it at the right time. It does give me some indicators. I don't want to trade although considering the current market maybe that will make me some money..
One thing I know is that if you go long which is greater than 12 months and sell then you don't have to pay tax! Keep visiting for new articles . Wish I had come across your analysis before, I would not have lost all my fortune. Really unique and worth reading. Thanks for enlightening from a new angle. I will update it on the post . Thanks for pointing this out . Good blog and a good article. But there's a problem with the nifty link you've given for obtaining nifty PE's. Its only giving the index value and not the PE – can you post the correct link please. Thanks for that 🙂 . I am sure this will help long term as well as medium term investors . Manish wonderful analysis on markets,Its a eye opener for long term investors and iam going to give link to this article on my blog,So that long term investors will be cautious. No suiside manish,ur fantastic blooger,not a worry. I am extremelly happy to hear that someone is taking care of there finances because of my writing , I am sure there are many but you are first one to say it . Hey Manish!! DONT STOP..No Never !! I really like your articles, they are very informative. I really like the way you inspect market instruments. Your blog has inadvertently forced me to plan my financials. Thanks to your blog, I m no more a financial dumbo, who (until found your blog) just invested into marketing gimmic of smart agents. There is not even a single article of your blog that I havent read…and my crave for more is increasing with each new BUZZ you send across. Ur posts as always are worth reading. And i liked this PE thing very much was g8 to add to my Knowledge bank. nice article,as also nice new design. Ok You wont have to kill yourself over the blog its excellent and you don’t need approval from your readers coz you yourself know its worth!!! I personally feel that as long as you write for yourself and enjoy it you will always come out with gems. On the other hand if you start writing for others very soon this blog will become a chore! Once again keep up the good work and let those posts comin!!!! Hi Manish, For once I am finding a technical topic interesting. It will be very helpful for me since I was contemplating whether to book profits or continue buying or holding. Even find your post on booking partial profits appropriate for the current market situations.